The brittle Nan-Khatai is the sub continent’s most acclaimed confection. The lineage came into existence since the Mughal Era, whereas, some say its origin was from China as the literal meaning of Nan is ‘bread’ and Khatai is considered to come from 'Catai' or 'Cathay', the older name for China. 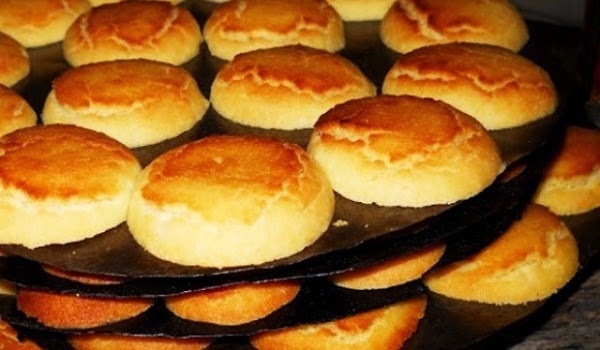 Some historian says Surat, a large port city of Gujrat in India, is considered the birthplace of Nan Khatai. Near the end of the 16th century, two Dutch explorers started to make trading posts in India for trade in spices. For this, these traders settled in Surat and structured a bakery to produce bread for their own consumption. Later, when these traders left India, they handed over the bakery to one of their workers named Dotivala. Dotivala continued baking bread for the Dutch being left behind and the bakery became 'Dotivala Bakery'. But with the passage of time the demand for bread declined as more and more Dutch started leaving India. Hindus would not eat this bread because of its prohibited ingredients. So, the left over bread would become dry and crispy and sold to the underserved at discounted prices. The locals liked the taste of this inexpensive dried out crispy bread and this led Dotivala to change the shape of the bread and dry the slices in the oven. Hence, for financial survival, Dotivala accidently became the master of fusion cooking and with alteration in Dutch bread, he created the local sweet called “Nan Khatai”. The fame of Nan Khatai spread all over India; they were transported to markets in Bombay where it became a famous teatime snack. The traditional delicacy was also quite famous amongst the Mughal emperors and it was cooked and served on many occasions for the Royal family and their workers to rejoice moments of cheerfulness. In Pakistan, Nan Khatai has its roots in the city of Lahore, famous for its cultural heritage and centre of Mughal history in Pakistan. Lahore’s well-known Khalifa Bakers are famous for their Nan Khatai and people from all over the world visit their bakery to attain pleasure of this traditional sweet. The tradition is now reviving and being replaced by the likes of the commercially available cookies at every big and small store in all major cities of Pakistan. The humble Nan Khatai is now gracing tea times at both work and home. The pioneers of this being LU with their Bakeri Nan Khatai have transformed the conventional cuisine into biscuits of the modern era. With the launch of Nan Khatai, LU has become the first manufacturer of Nan Khatai in the confectionary industry of Pakistan. By playing a key role in reviving this product, it has been able to transcend the geographical limitations. Nan Khatai is now available nationwide in packaged form. The packaging of Bakeri Nan Khatai itself is a tribute to its origins and history and has been appreciated both nationally and internationally. Bakeri Nan Khatai is also the first Pakistan brand featured in the Packaging of the World (an international website that showcases the most creative packaging from all over the world). Following the footsteps of LU other industry players have also entered the market sensing the enormous potential of this product. What would you put on this or eat it with? interesting - I like pretty much all bread-based food! Ah my family have this with tea when we have it in!